Daisy Geyser is one of the most accessible and impressive geysers in Yellowstone National Park. Daisy Geyser is in the Upper Geyser Basin and is reached by an easy paved foot and bike path from the Old Faithful Inn area. 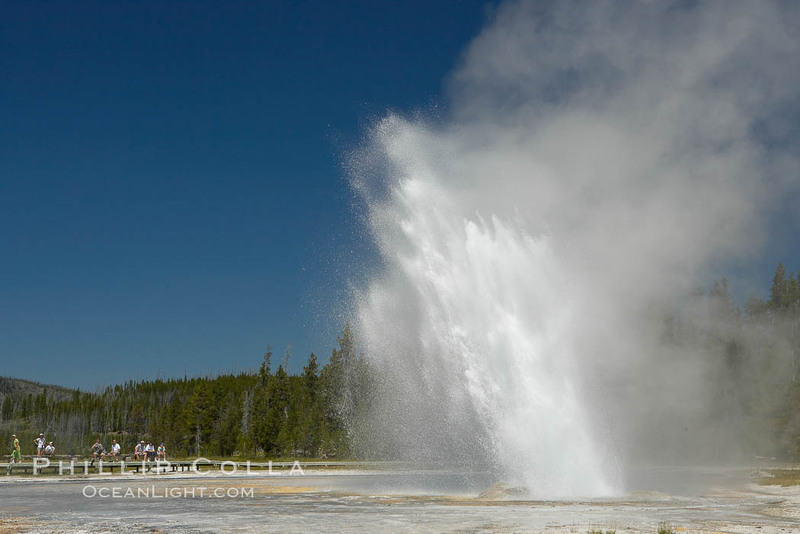 The park rangers include Daisy Geyser in their list of predicted geysers; it erupts with an interval of about 2-3 hours and lasts for about 4 minutes, reaching heights up to 75 feet (25m). This photo shows the geyser at peak eruption with its characteristic “tilt”. Viewers can be seen on the other side of the flats surrounding Daisy Geyser. Keywords: daisy geyser, yellowstone national park.